After working all week on a project for Purse Palooza, and before diving back into quilting my Bee Sewcial quilt, I figured I better work on a couple of the smaller items on my to-do list. Happily, improv was the name of the game. For Seattle Modern Quilt Guild's QuiltCon 2016 Charity quilt, we were asked to make solid improvisationally pieced diamonds "pieced in a modern style using a main color and one or two accent colors. The accent colors should be minimal, comprising approximately 15% or less of the diamond." The colors available were all in the palette chosen by the Modern Quilt Guild, and we were asked to choose among limited groupings to evenly distribute the colors among the guild. I picked yellow as my main color, with accents of white and off-white. 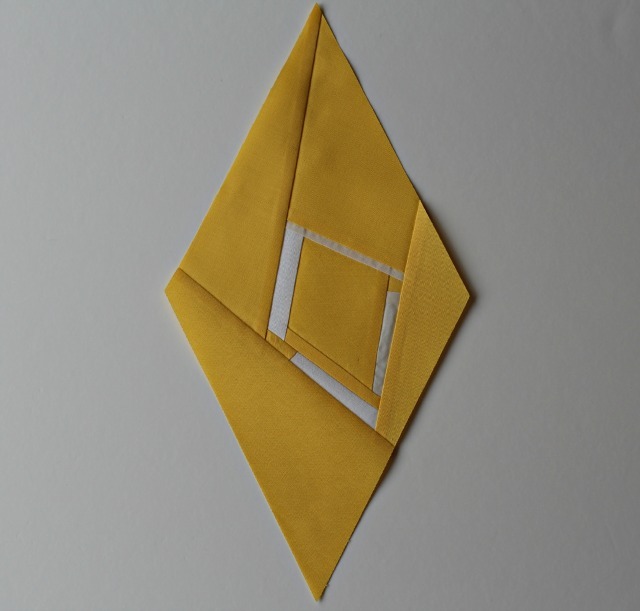 We were also given a template for the final diamond, which measured 13" tall by 6.5" wide. I enjoyed working with a shape that wasn't in my normal repertoire. Once that was done, I felt warmed up enough to face my Bee Sewcial assignment for the month. 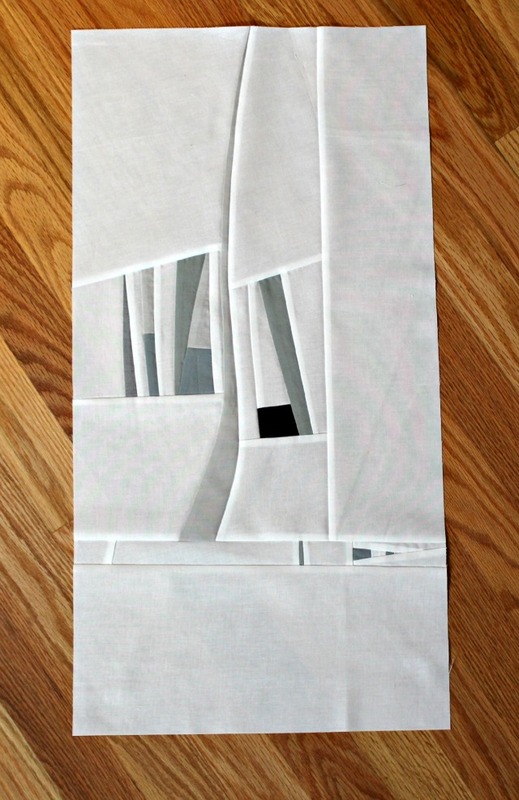 Felicity/Felicity Quilts chose a theme of Minimalist Abstract Winter Landscapes in black, white, and shades of gray. Remember, we work only in solids, and other than the white 'background,' I was able to pull the rest from the scrap basket, which felt good. One photo in particular called to me from Felicity's inspiration board. Let me know if you can pick it out, ok? Both of these are fabulous, but the black and white........!! Wow! Great job. Love the second one - I can't wait to see her finished quilt. Great blocks - love them both! I love these blocks! I especially love the winter white theme for this next go around of Bee Sewcial! I cannot wait to see what you all come up with! Yup! That's the one I picked!! You are good at improv!! Love both blocks. Haven't tried my hand at this yet. Nice improv blocks. I especially like the wintery one.